Throughout the Thanksgiving season, the focus is most often on what has been given to us, how we’ve toiled and tilled and gathered our harvest. We take note of and receive our blessings with humble gratitude. We might even write our blessings down on construction paper leaves and affix them to a hand-crafted, fabric tree. We then gather around our festively decorated dinner tables and share our feast of blessings with those we love and we pray the prayer that sounds like this, “and now, Lord, we give you thanks for these thy bountiful blessings”. On that first Thanksgiving celebration, as the Pilgrims scurried about preparing their feast, they saw their neighbor and collectively and generously decided to share. When the native American Indians came to the table, they brought the fruits of their harvest to share as well. As was in line with a heart that desires to give thanks for their gifts, they prepared their feast. And shared. Such as it was. Such as they had. A friend of mine recounted this story to me recently and graciously agreed to let me share it. When my kids were young (6 and 4) we had a house fire. We were living in a hotel room so we could be close to the house and take care of things at home. We ended up being in that little room with two active boys for 40 days. Our church was amazing with bringing us meals so we didn't have to eat restaurant food every night. They also brought us a nice care package. On Thanksgiving morning, the front desk staff called our room to say that we needed to come down to the lobby. Someone anonymously left a box for us. They told us that the lady was very sweet and said that "she was thankful to be able to give this to us". The box was filled with toys that the boys could play with in our room, good snacks, chocolate, bubble bath, and a wonderful smelling candle to make our room feel more like a home. The things in that package blessed us yes, but the anonymous act of kindness touched us to our deepest core. Those toys provided hours of entertainment over the next 37 days, I will say the chocolate did not last that long but was a perfect treat. We felt so loved during that period of time as people truly were the hands and feet of Jesus for our family. ~R.M. The early settlers noticed a way they could love their neighbors. A woman in my friend’s community noticed a way she could love her neighbor. And they opted to give and to love those who were right in front of them – such as they had. As we journey through this Thanksgiving holiday season, may we focus on being grateful for what we’ve received but also be mindful that we should be thankful to give. 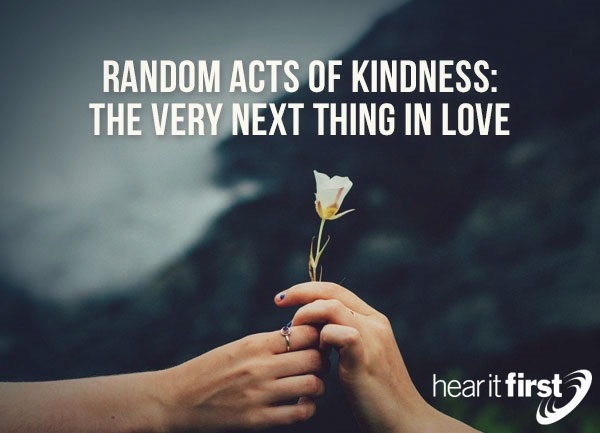 Let us not underestimate the difference a random act of kindness can make in someone’s life. May we collectively band together as Believers and share the blessings we have been given. Regardless of how much or how little we have to give. What is the very next thing you can do in love? If God is prompting you to love a neighbor, however random or even insignificant it may seem to you, I urge you to do so. God can take our random and simple and make it profoundly redemptive. If you would like some encouragement in this season of giving thanks and sharing love, Casting Crowns has set up The Very Next Thing Email Promptings. This weekly email is intended to encourage and challenge those who sign up to do the very next thing in love. To do that very next thing that is right in front of you. Sign up now and be a part of something that will encourage you as you share your bountiful blessings.